It was a great sunny day in Cape Town at Christmas time. There was a lot on our plans to see and do in Cape Town. 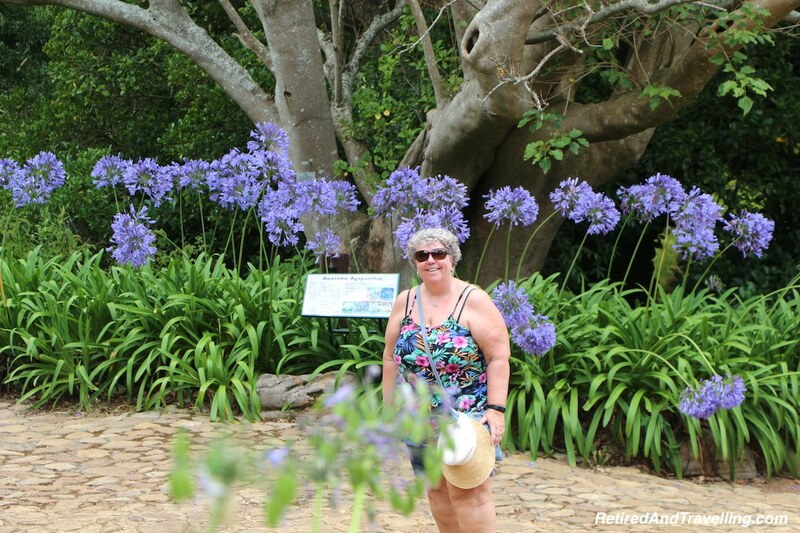 We had our 2 day Hop-On-Hop-Off (“HOHO”) bus ticket and the first thing on our list was Kirstenbosch Gardens. 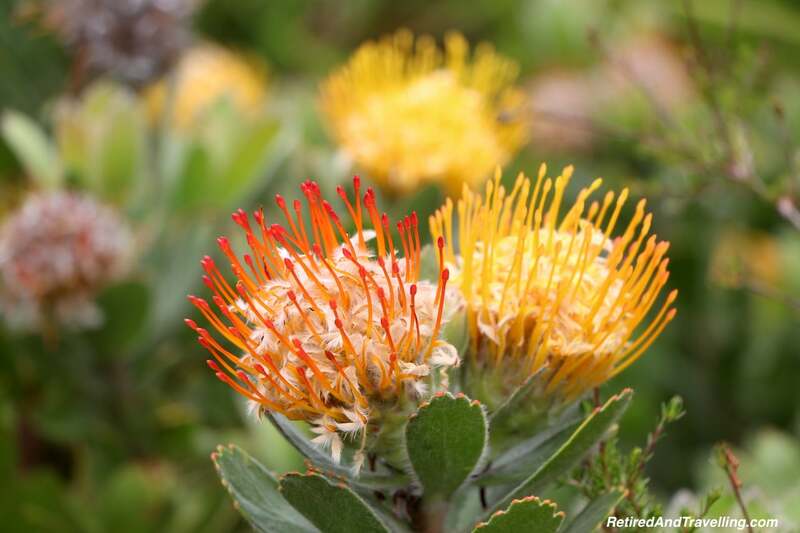 Our early glimpses into the flowers and trees of Cape Town had started on our quick tour of Cape Town when we arrived. 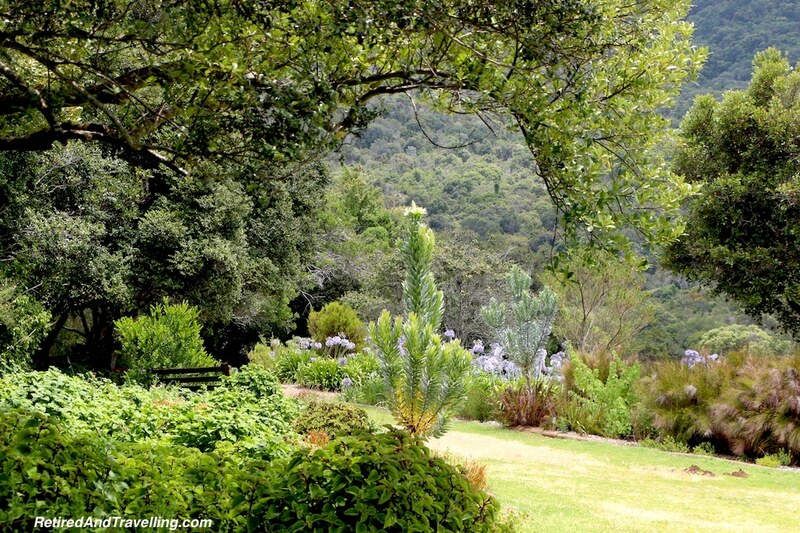 These vast gardens located on the lower slopes of the backside of Table Mountain would provide us with so much more. 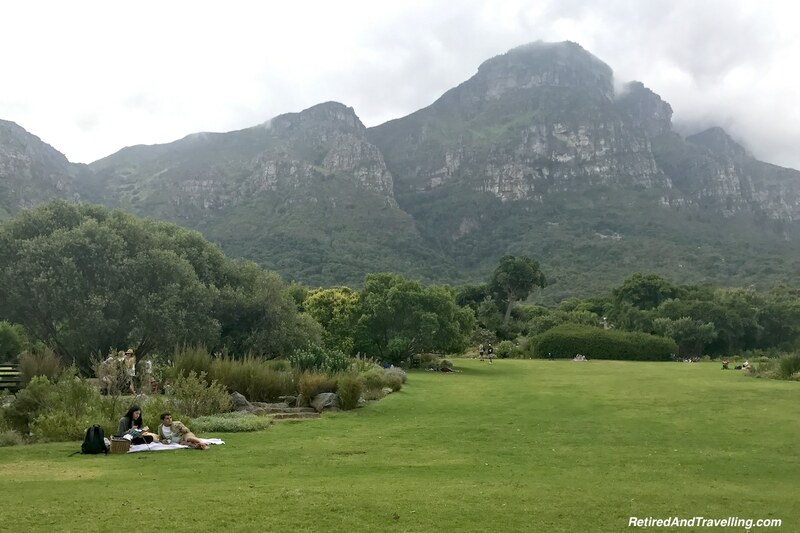 With benches strategically located everywhere, everyone can relax in Kirstenbosch Gardens and enjoy the views. 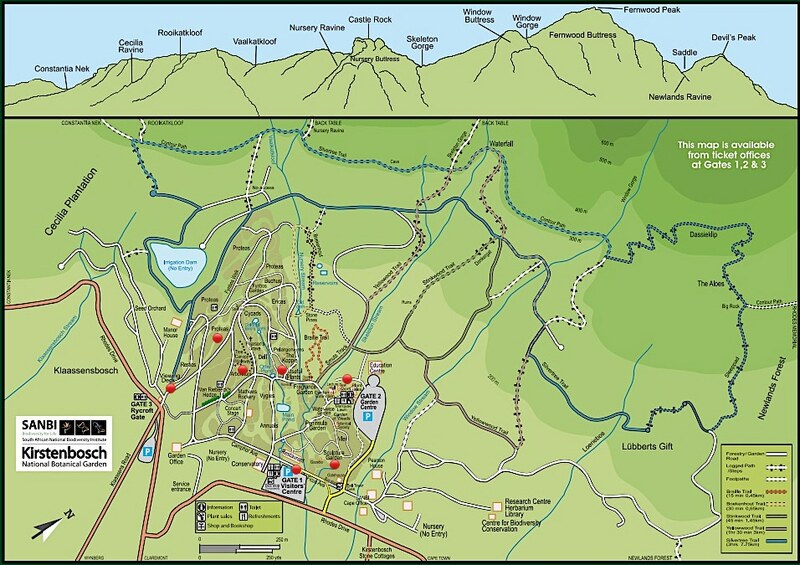 We paid for admission and were charged for a small paper map of the site. Sitting in the shade we decided which parts of the garden we would target on this visit. We had no real idea of how big this garden was. The spots we had picked were diagonally opposite in the park. We would certainly see a large part of the gardens on our walk. 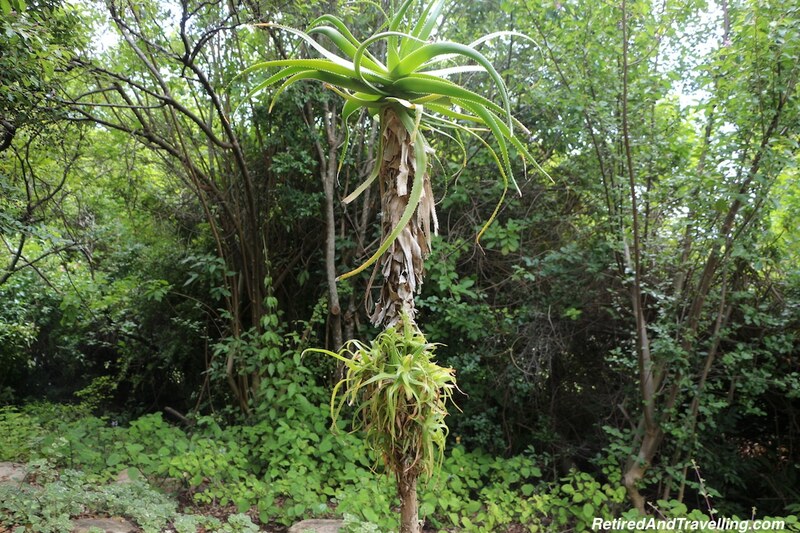 The Kirstenbosch Gardens contains a massive array of local plants and trees. The displays are well marked so that you can learn as you walk. Our first target was the Arboretum. We were confused at first until we realized that this was not a single display but a large area filled with local trees! We wandered off the stone path into the paths meandering between the trees. 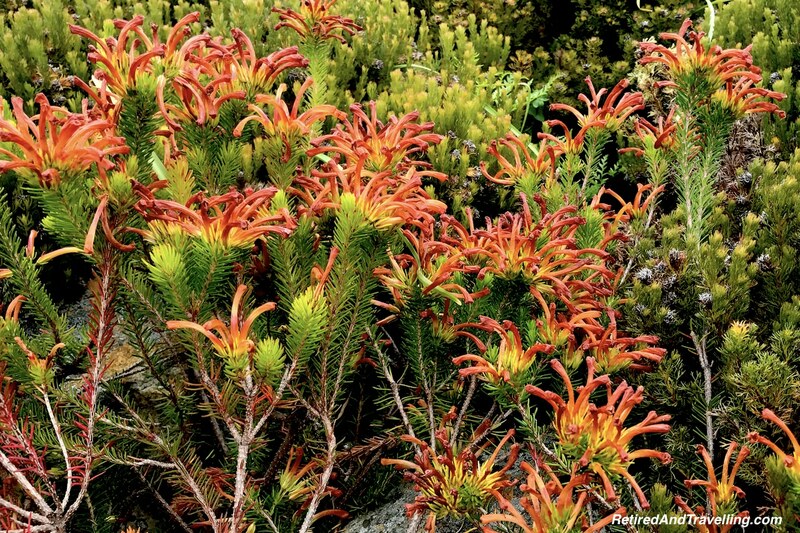 You could see the wide variety of flora and many very different than at home in Canada. 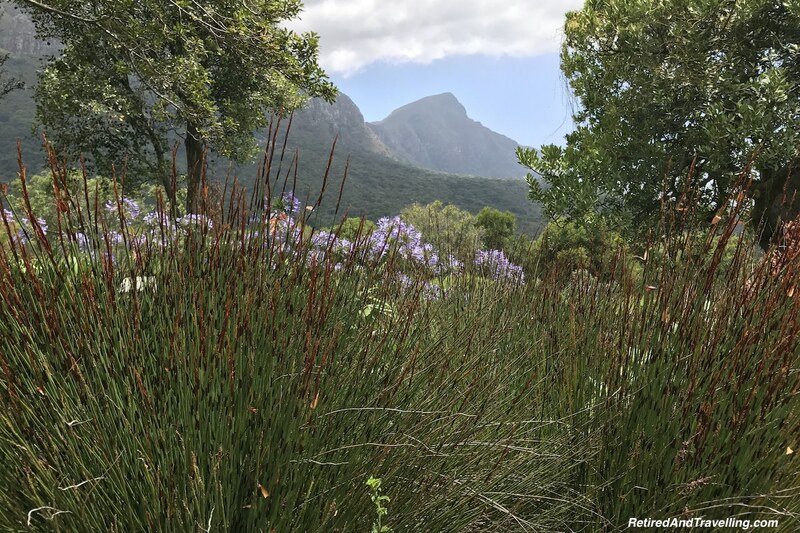 If cool, shady spots are what you are looking for, the Arboretum will offer a great spot to relax in Kirstenbosch Gardens. It is summer in Cape Town in December. Many of the flowers had already bloomed in the spring. It would have been quite amazing to have visited earlier in the year. 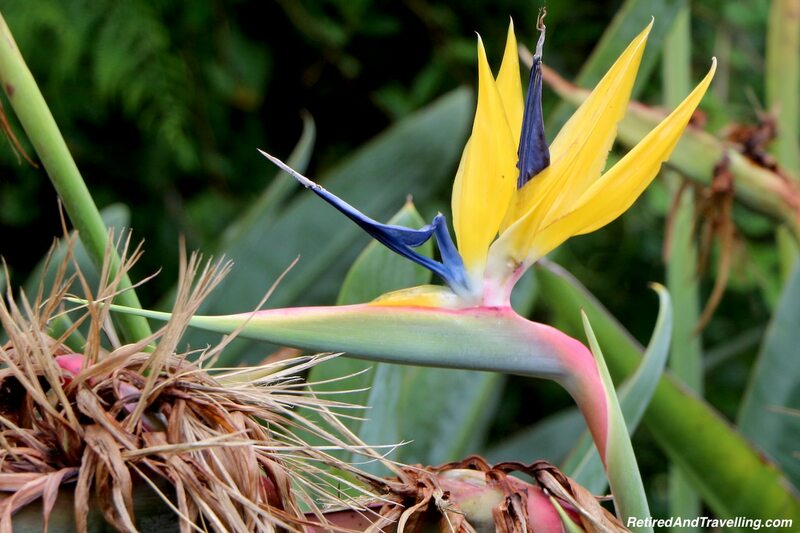 As we walked through the site, several of the local flowers were still in bloom. I was drawn to the pineapple flower. 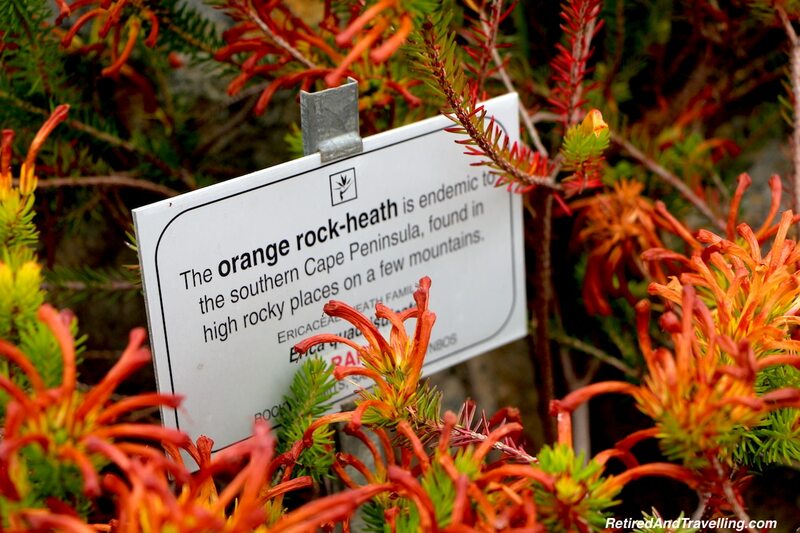 Sometimes you are not sure how a plant got named. 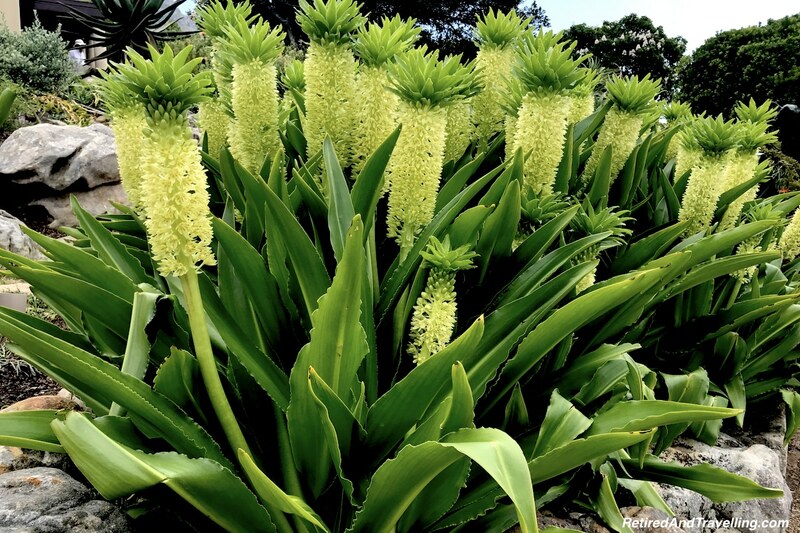 But it was not hard to see the pineapple shape of this flower. 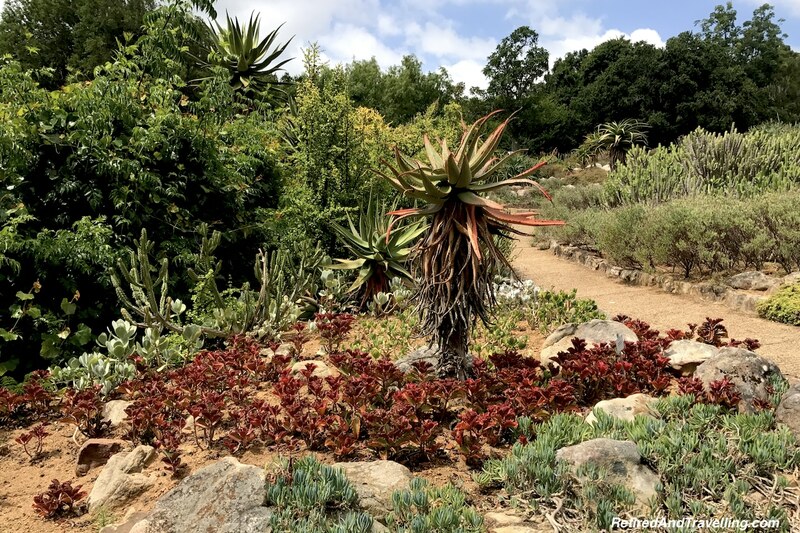 A section of the gardens was dedicated to “useful plants”. It shows you how indigenous plants can be used for making tea, dyes, rope, baskets and for various medicinal applications. I went over to one group of flowers. When David noted that these were Camomile plants, I backed off. Camomile is of the same family as Ragweed. As a hay fever sufferer, I really did not need to breath in Camomile. With the abundance of Camomile plants we saw in Cape Town, it was no wonder I was stuffed up all the time! We kept following the signs that would get us to the Rycroft Gate and the Viewing Deck. I guess I should have realized this was an uphill walk the entire way. But I had not considered that the whole garden really was on the slope of a mountain. Billy Goat Linda put her feet in gear and climbed! The paths wound their way through various parts of the gardens. 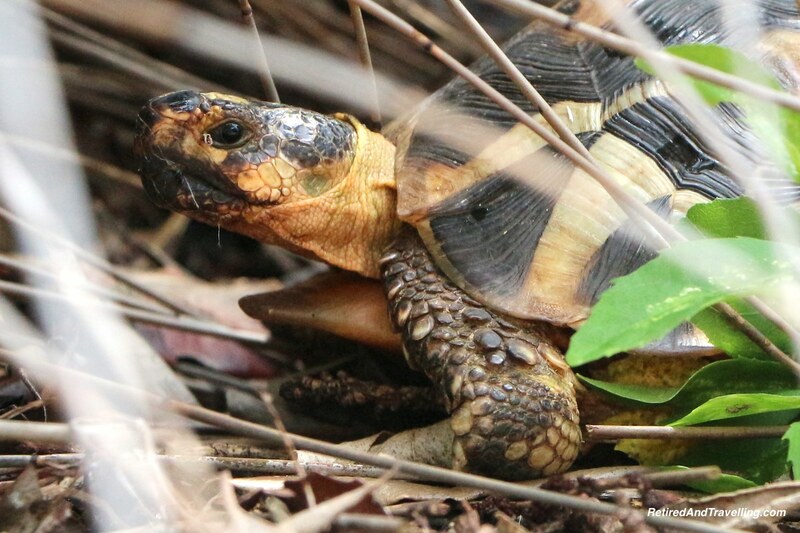 There was lots to see as we walked. 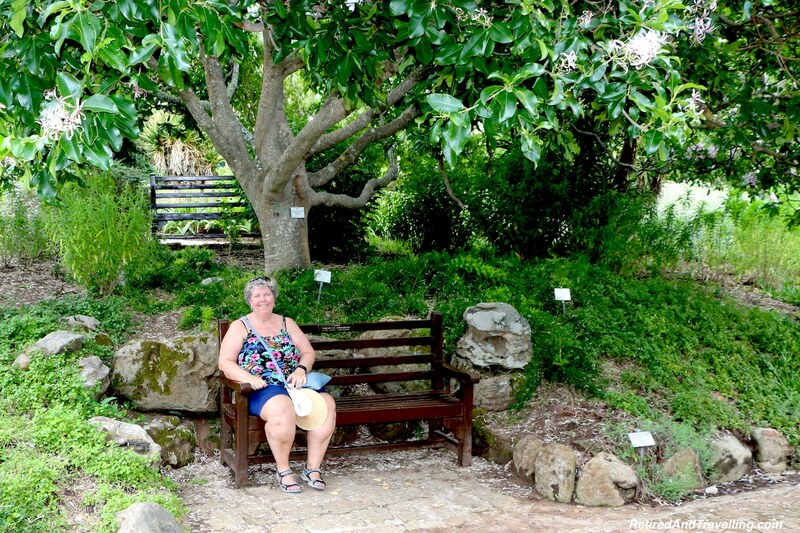 Benches have been placed at regular intervals so you can rest and relax in Kirstenbosch Gardens as you climb. When we got to the viewpoint you could look up at the mountains and the shifting clouds. You could look down over the garden to the valley below. It was worth the climb to the viewpoint. 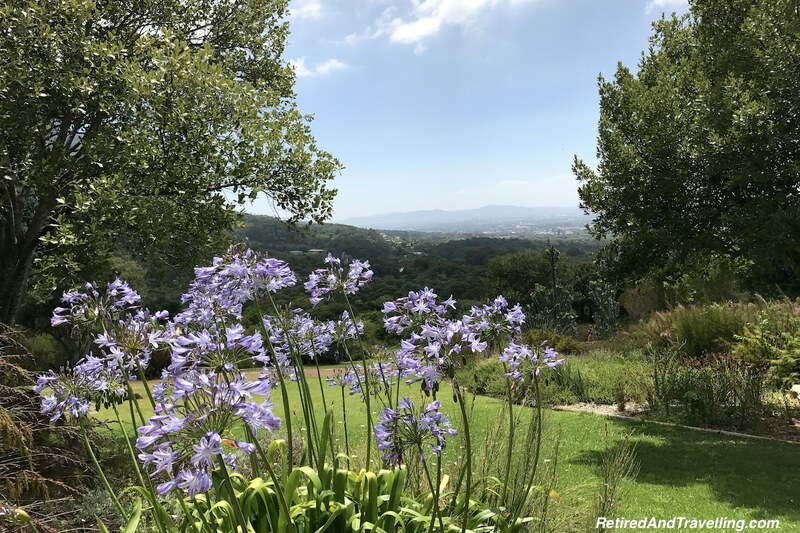 A great spot to relax in Kirstenbosch Gardens. 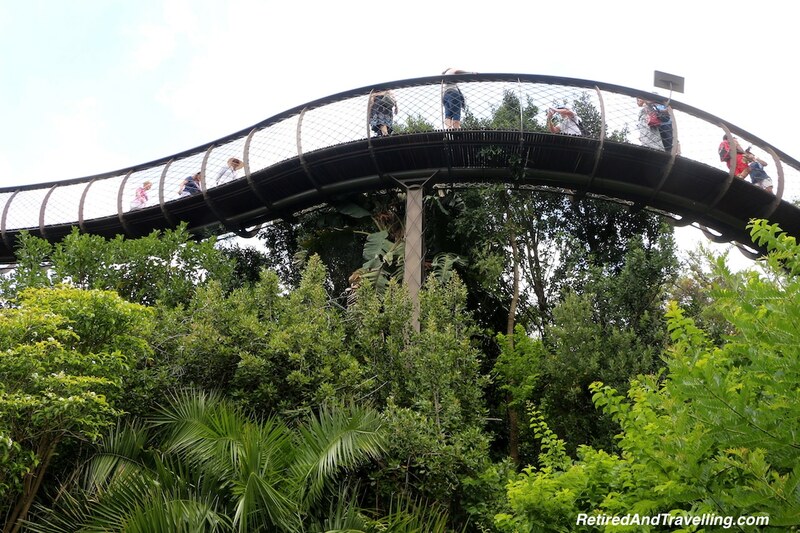 On the high ground you will also find the Canopy Walkway. I have not yet had the opportunity to take a zip-line through a canopy top. But I had that image in my mind as we followed the signs. There was a warning sign before you turn the last bend about the walkway swaying as you walked. This continued to feed my imagination! 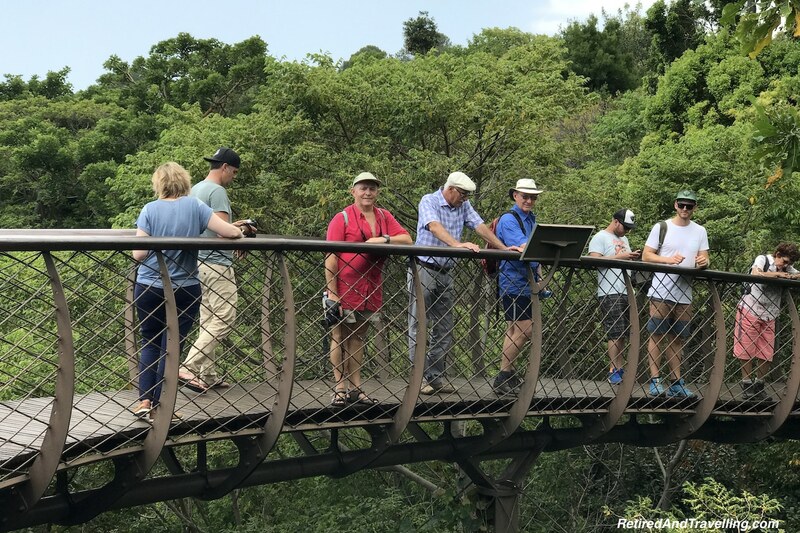 The reality turned out to be a canopy walk about 30’ above ground. We were indeed walking at the top of many of the trees in the Arboretum. 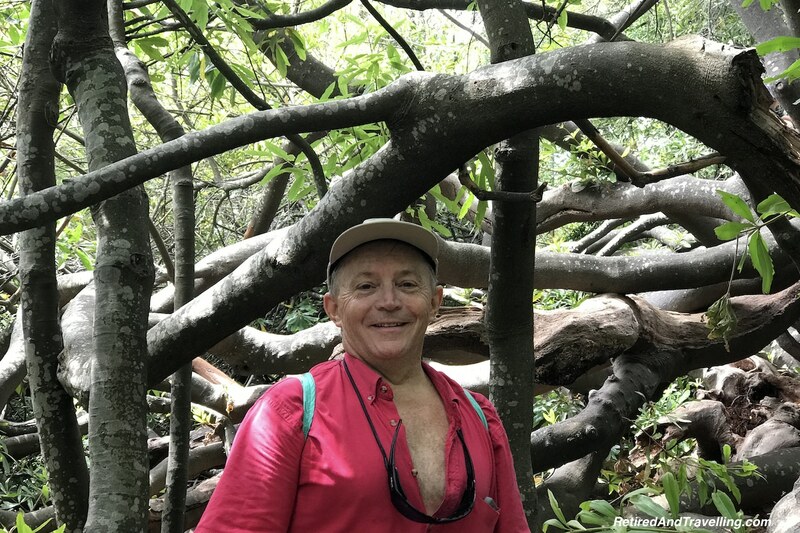 But those trees were not the giant rainforest trees you think about for a canopy experience. It was still a nice walk along the suspended walkway. If you had not walked all the way to the Viewing Deck, this also offered you a nice panoramic view. 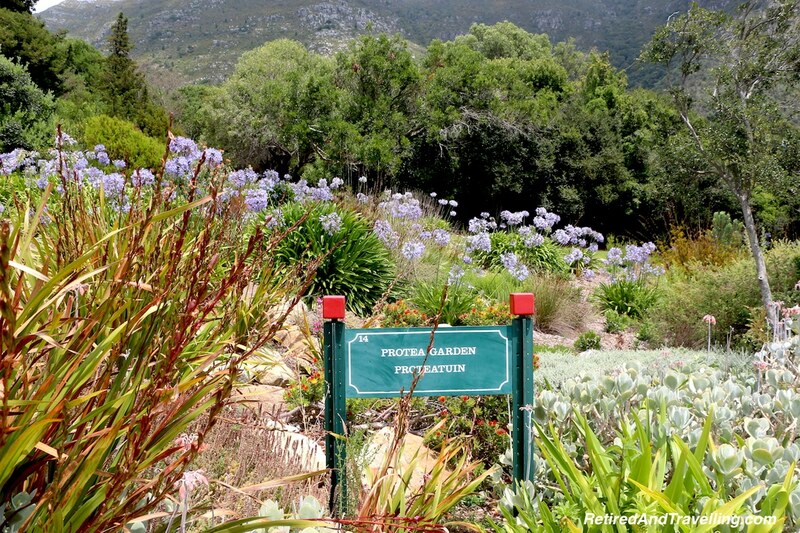 There are several places to eat, refresh and relax in Kirstenbosch Gardens. We had initially planned for a snack but after several hours exploring the gardens, we were ready for lunch. The Tea House had a surprisingly full menu and lots of seating. 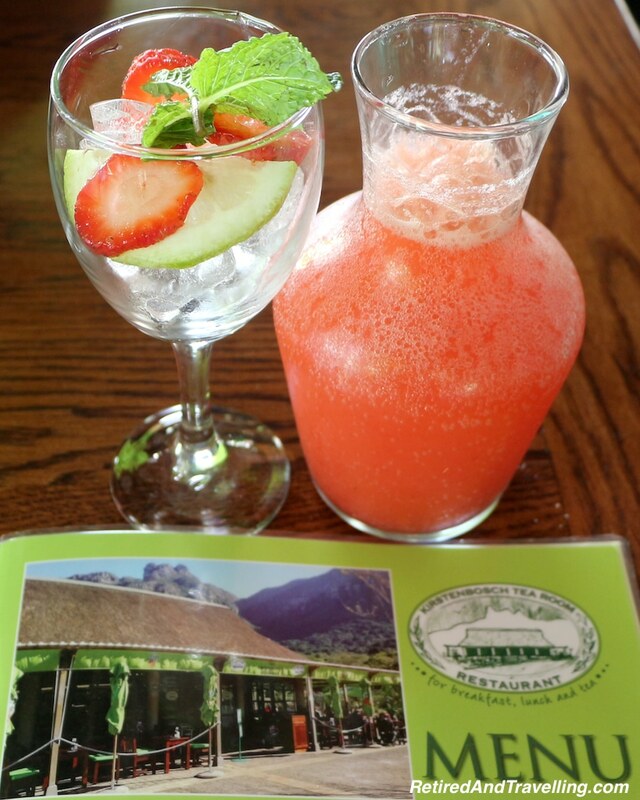 We had a great lunch with a pitcher of strawberry lemonade. The bread was made fresh. Desserts tempted us but after our salad lunch, we stayed strong. We wandered back towards the main gate past the African stone sculptures carved in the Shona tradition. 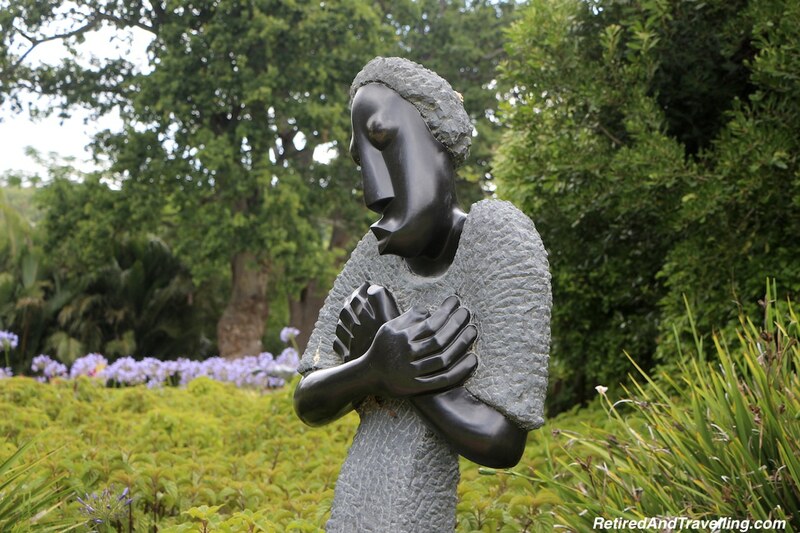 The stone sculptures are named after the largest tribe in Zimbabwe engaged in sculpting. This is the only country on the African continent that has large deposits of stone suitable for sculpting. Artists draw on mythology, folklore, rituals and beliefs in ancestral spirits for their inspiration. 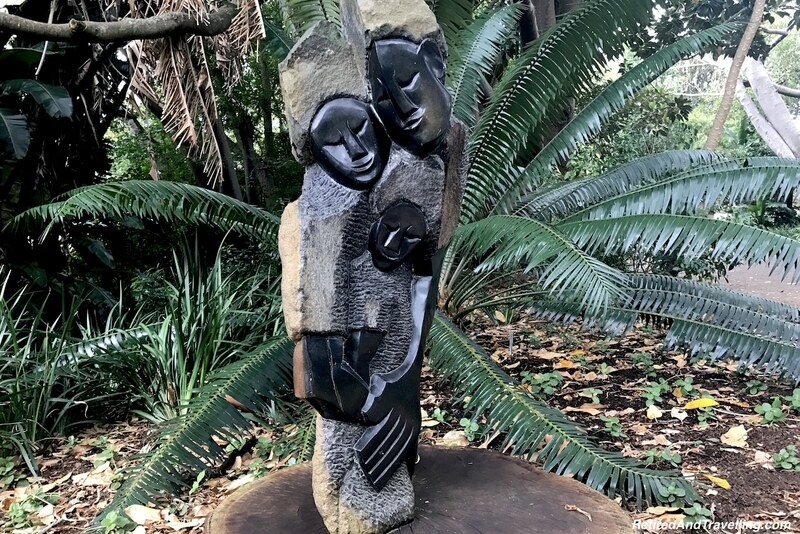 Shona sculptures demonstrate a mix of the physical and the spiritual. It appeared that women were also a significant source of inspiration. 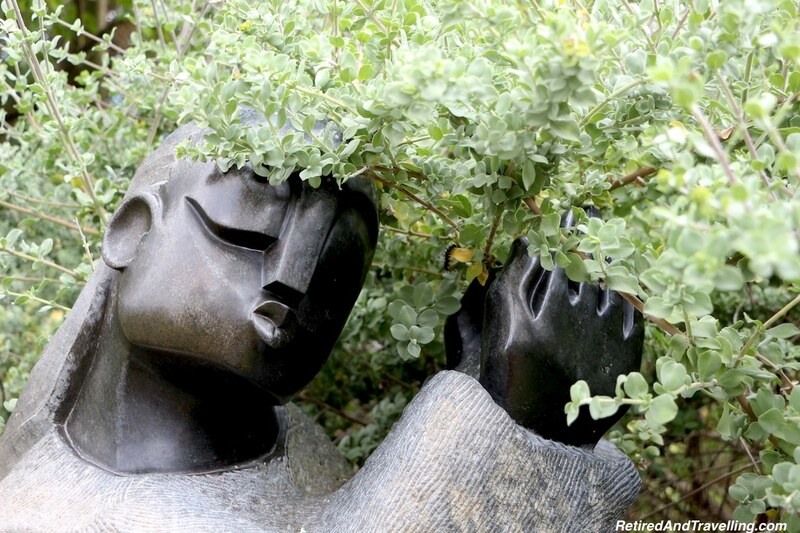 We found nudes, a dancing girl and a mother and child depicted in the gardens. We enjoyed seeing the statues scattered about the garden in very natural settings. Many were sitting right in the trees. 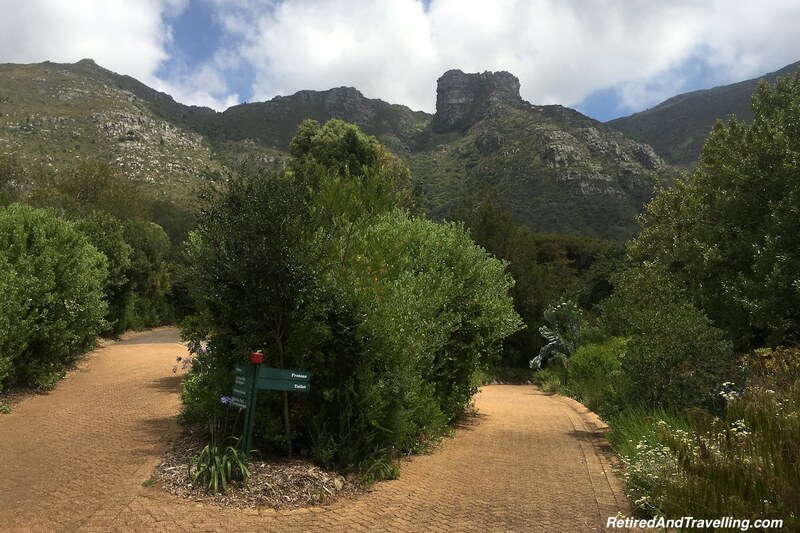 It was a great spot to contemplate life and relax in Kirstenbosch Gardens. 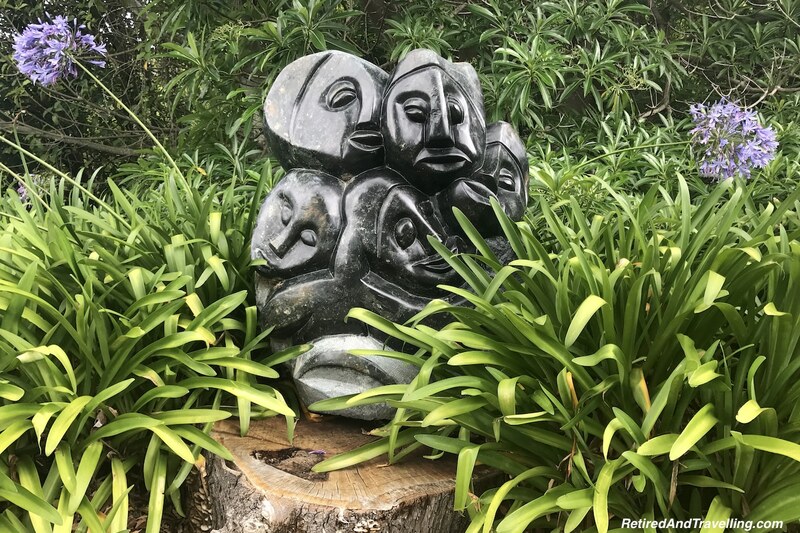 It reminded us very much of the outdoor sculpture garden we enjoyed in New Orleans. The gardens were vast. They provided a great glimpse into the natural environment of the Cape. While the gardens move ever upwards on the side of the mountain, there are many spots to sit and enjoy the views. 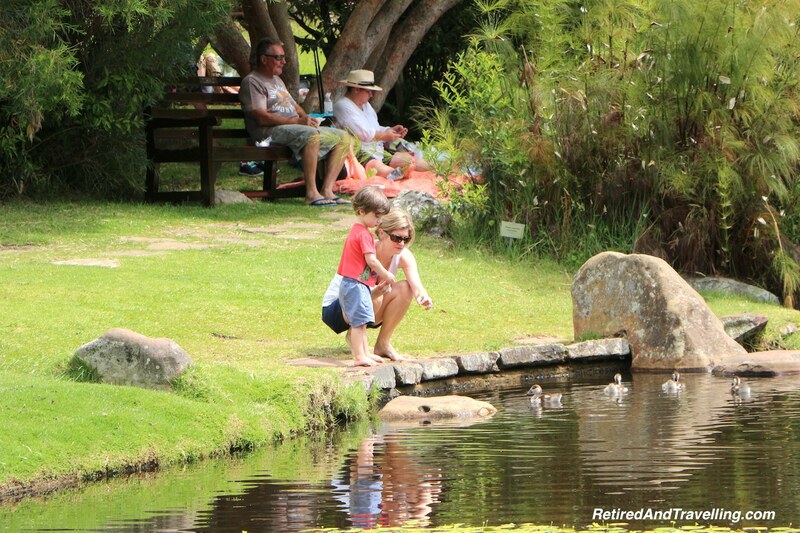 You will find no problem finding the time to relax in Kirstenbosch Gardens. 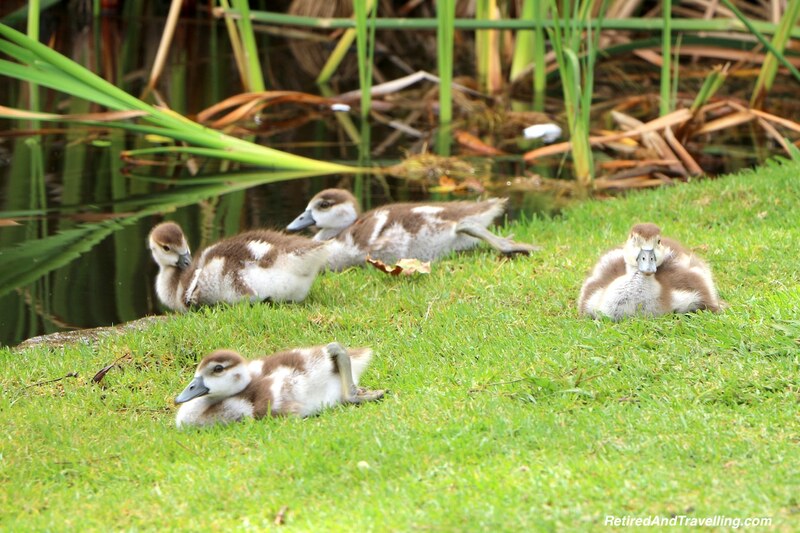 The broad lawns are great spots to put down a blanket. Many families had come with their picnic hampers. Enjoy the sun or take refuge in the shade. One of the great things to do when you visit Cape Town! 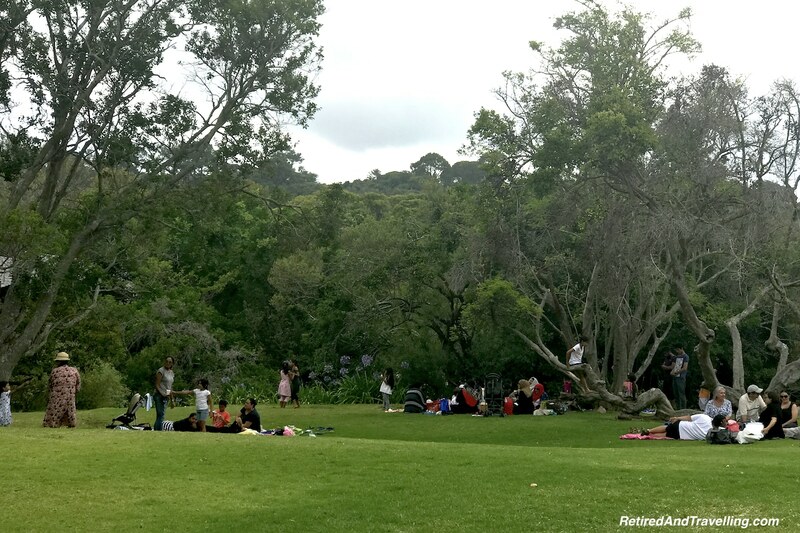 Did you get a chance to relax in Kirstenbosch Gardens? What was your favourite spot?